Distance Learning gives good chance for higher and further education to everyone who works and cannot attend offline classes. Most of colleges in US have the distance learning classes, but some of them require to attend one or few time offline classes or to visit the school for executive reasons. On the other hand, 'Distance Learning Only' schools (also known as online school), recently opened, gives opportunity that students can get online degree without any school visiting or . There are 40 distance learning only schools over US. For detail school information, just follow link on school name. US-NEWS announced the National Liberal Arts College Rankings. Next table shows top 10 National Liberal Arts colleges and their institutional characteristics. 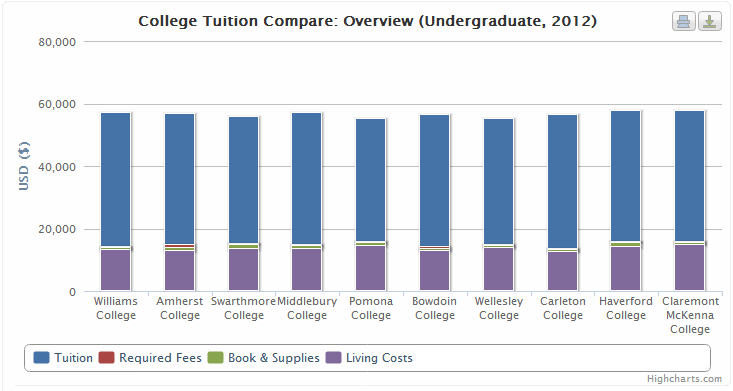 Tuition comparison among those colleges are shown in next table and charts. In fact, in-state and out-of state tuition of those colleges are same. So, we just show in-state tuition and living cost on the chart and table. 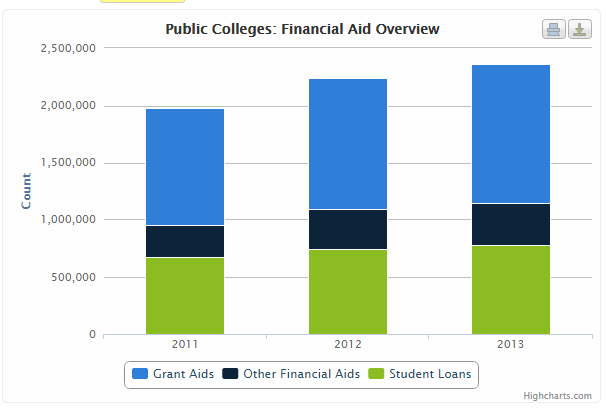 You can see various charts and tables about tuition and financial aids of those colleges at Liberal Arts College Tuition Comparison . 91 colleges - 42 public and 49 private schools - and universities are located in Alabama states, USA. 69 schools have certificate program course and 45 schools offer BS degree. For graduate schools, 29 schools have Master's program and 13 schools have doctorate program. 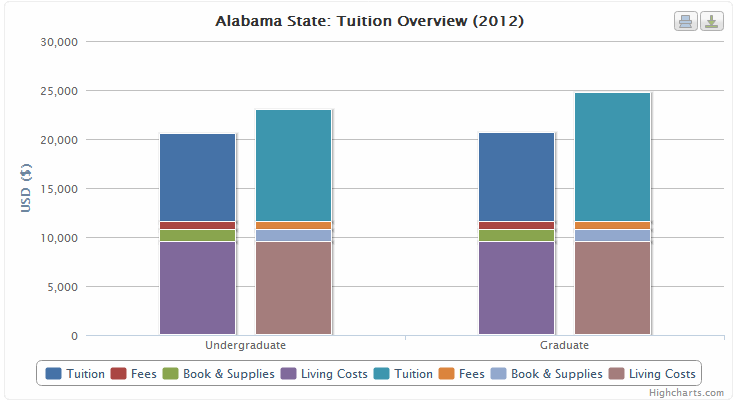 Next tables shows the average tuition costs of Alabama Colleges in 2012.
and Summary Table for comparing tuition and financial aids of Alabama Colleges. You can search and find your right colleges by setting various options on upper pages. Graphic chart for upper summary table is below. You can see various comparing charts when visiting the pages. In New York State, there are 427 Colleges and Universities. 235 4 years or high colleges. 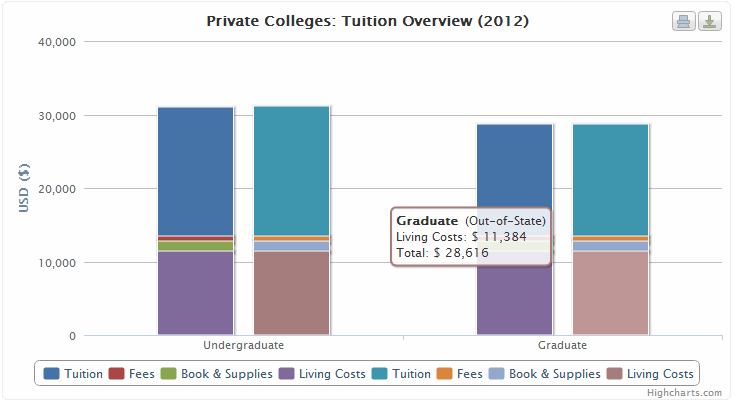 Next table shows 2012 average tuition and living costs of colleges located in NY state. Next chart visualizes the average tuition of NY state colleges. 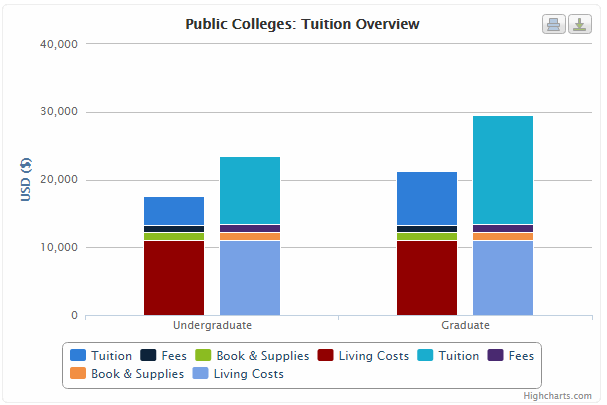 You can see various graphic charts of tuition, living costs, financial aids, and other cost related data at New York State College Tuition Page. 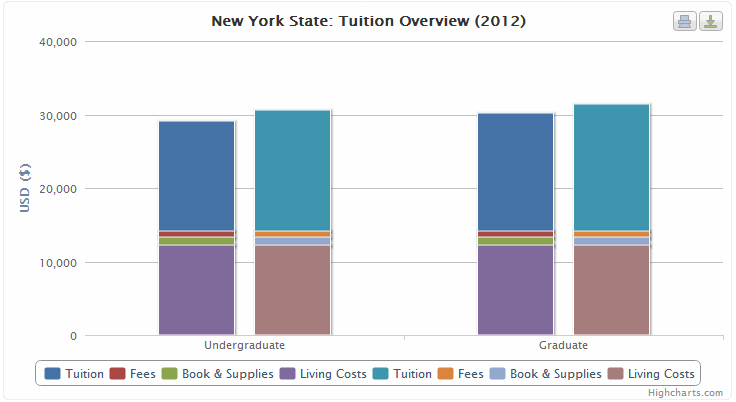 In addition, tuition summary table for NY state colleges shows average tuition of every schools located in NY state. You can set various filter to find your schools in that page. And you can see detail information of each college in NY state at NY state college search result page. Pennsylvania states have number of top class colleges in US. Especially, Allen Grove, an author for about.com, introduced 19 top colleges in PA state. The colleges definitely high-ranked schools and many students in PA and out of PA wants to attend one of those schools. Here, for helping tips concerning tuition and financial aids, we summarize and compare tuition and financial aids between those 19 PA top colleges. You can see full comparison data at PA Top Colleges Comparison. Next table shows general comparison data of 19 Top Pennsylvania college by location, school type, degree offer, campus setting, campus housing, and distance learning opportunity. 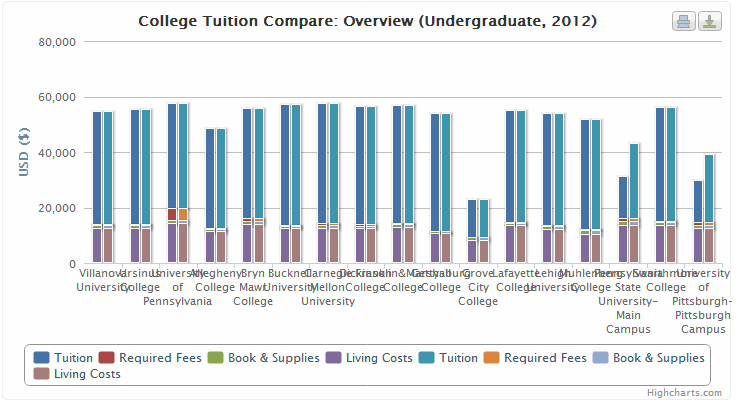 This charts shows in-state and out-of state tuition, required fees, books, and living costs for undergraduate of 19 Top Pennsylvania colleges. You can see various charts for comparison data at PA Top Colleges Comparison. This table summarizes in-sate and out-of-state tuition, fees, and total costs for 19 Top PA colleges. The summary table is available here for comparison between any colleges in US you want to compare. In addition, we've analyzed average tuition, other expenses, and financial aids amount. Following table and chart show the overview of public college tuition and other expenses in 2014. You can see all public colleges and narrow down by your concerns at public college list page. If you consider one of public school in your future, comparing tuition and financial aids between them might be a good way to make right decision. You can see various statistics charts and tables of public colleges at public college statistics page. Following table summarizes 2012 out-of-state average tuition by states. Note that Average out-of-state tuition over all schools in US is $ 13,234 or $25,392 including fees ($812), book & supplies ($1,236), and Living costs ($25,392). If you want to check in-state tuition by states, please read the article in-state tuition comparison. And comprehensive data of state tuition can be found at state tuition comparison page. Following table summarizes 2012 in-state average tuition by states. Average in-state tuition over all schools in US is $ 10,947 or $23,055 including fees ($762), book & supplies ($1,236), and Living costs ($10,110). If you want to check out-of-state tuition by states, please read the article out-of-state tuition comparison. 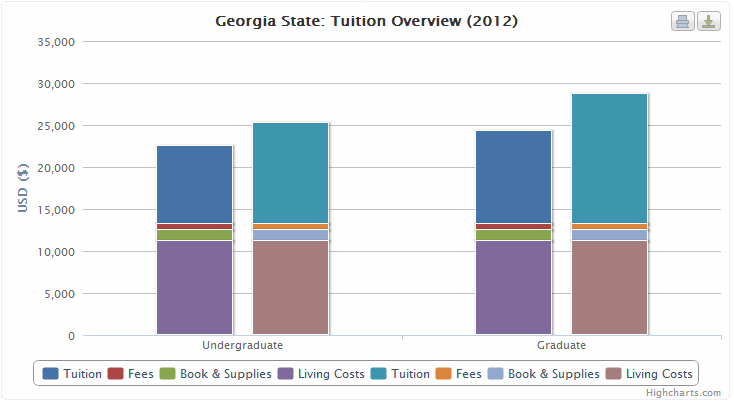 And comprehensive data of state tuition can be found at state tuition comparison page. There are 472 Colleges and Universities in New York State - 115 public and 357 private schools. The average In-State tuition of NY state is $14,981 and average Out-of-State tuition of NY state is 16,492. The average amount of financial aids is $8,210. You can access comprehensive information about tuition and financial aid of NY state at NY state Page. 47 colleges among them are public and 4 year schools. If you want to attend one of those schools, the tuition and total costs for the schools might be an important information. In addition, you can narrow down or specify colleges in NY state at NY state tuition summary page. There are 285 state universities over 50 states and other areas over United States (academic year 2016-2017). If you want to attend one of those state universities, comparing tuition and financial aids between them is a good way for choosing your right school. The average in-state tuition & fees for the state colleges and universities are $7,636 and out-of-state tuition & fees are $16,262 for year 2016-2017. Following table summarizes the 2017 tuition comparison between the state universities - In-state tuition, out-of-state tuition, and required fees.